Catch and Release fly fishing only. A little summer in the spring. First year in the salt. A two-year-old sea-run Coastal Cutthroat trout. Our spring beach fishing has been uncommonly pleasant this year. And we are still enjoying summer like conditions this month, with more fair weather in the forecast for at least the next week. You would think that all of this sunshine and blue bird weather would slow the fish down, and keep them off of the surface. 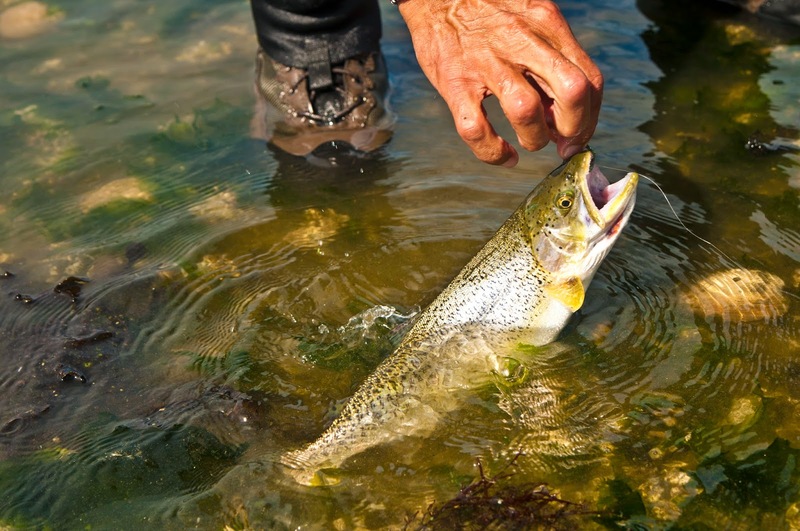 But this has hardly been the case as we have encountered so many bright wild and willing trout under sunny skies, in shallow clear water, often at the edges of the beach. This may be due to the cold waters flowing in on the incoming tides, and the movement of forage species on those currents. But one thing that I know is that these trout don't mind a sunny day one bit. If we were river fishing we wouldn't likely find these fish holding in shallow, brightly lit waters this way.This time of year we can get cool, dark mornings, fog, and almost no wind until late morning. By lunchtime if can be 70 to 80 degrees and sunny. Under cooler skies, Jon Tobey searches the currents for a wild sea-run. My salty fly fishing Tip-of-the-week: Fish the shallows first, no matter what the tide is doing. Almost every visiting angler, new to these waters, will wade out into hip deep water and haul off the longest cast that they can make right away. Often they will miss the fish that were right at their feet. Sometimes they will be feeding so close to the edges that you can see their dorsal fins on the surface of the water. Don't be in a hurry. Hang back, take it all in, study the edges. And don't hesitate to try a dry fly! Yes, dry flies work in saltwater too! Try some Muddlers, Caddis, Stimulators, and poppers. You can work into just inches of water with these flies. And there is nothing better than a slashing hard take on the surface in shallow water. Just be sure to give those flies plenty of action. Don't worry about "drag", those flies have to look alive! 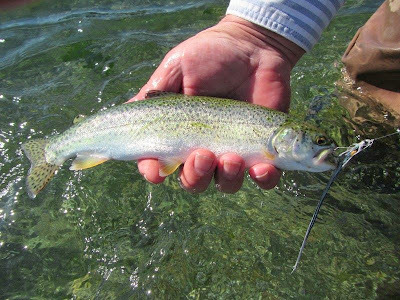 Shallow water sea-run Coastal Cutthroat trout. With these moderate tidal exchanges during the day right now we can approach things more lightly. Shallower, slower water often requires gentler, quieter presentations of the fly. And if there isn't any wind, then we should probably be using smaller flies too. Especially when fishing in close to shore. In these instances I will be using fluorocarbon leaders. Sometimes I won't wade at all for the first half hour or more of my fishing. You can learn a lot from fishing the edges of things. Occasionally I will make a day of it, just to see if the fish are there. Then all I need is knee boots and a greased Muddler. Don't miss the world at your feet. Celebrating 35 years of fly fishing adventures! In celebration of my over 35 years of fly fishing experience, I am going to be extending a $35.00 discount to every returning angler date this season. From April through October, if you come fishing with me, and you or a partner have been a fishing guest in the past, you will receive the $35 discount. Must be booked in advance.